Traffic reports indicate there is disruption in some areas of the county causing delays for motorists as well as bus replacement services on Southern Railway. Davigdor Road in Hove is currently closed in both directions causing delays in the surrounding area. 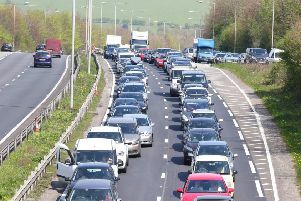 There are also reports of slow traffic on the A21 London Road near Hastings. Due to planned work buses replace train services between Three Bridges and Brighton and between Three Bridges and Lewes. This will also affect the Gatwick Express which will operate a bus service between these stations.